Posh centre-back Ryan Tafazolli (left). Peterborough United players are determined to finish their League One campaign with no regrets. Three defeats in a row in three different competitions has spread fear among the club’s fanbase that the play-offs will be missed for the third season in a row. But powerful Posh centre-back Ryan Tafazolli believes that won’t be the case. “This is a hugely talented squad,” Tafazolli stated. “We have massive belief and that’s still the case despite the last couple of results. “It is getting to that point in the season where every game is like a cup final. “We know how important it is to put a run of form together and pick up several victories in a row. 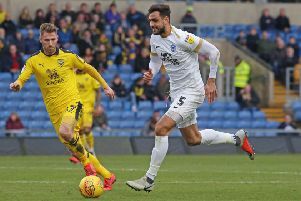 “We are going into every game with a positive mindset determined to play the Peterborough United way, which is getting on the front foot and trying to score as many goals as possible from now until the end of the season. “We don’t want to have any regrets. We know we can achieve what we set out to achieve. “We are a in a decent position in the league and we need to make the most of that starting on Saturday at Gillingham. Gillingham manager Steve Lovell is expecting a tough for his side. The Gills are protecting an unbeaten home record in League One matches that stretches back to October. “Peterborough are a very good side with excellent individuals,” Lovell said. “You have to respect the number of goals Jack Marriott has scored and Marcus Maddison is a top player with a great left foot. Posh could recall midfielder Michael Doughty to the starting line-up.